Among the mostly modern array of cookware in my kitchen are a few oldster tools. My favorites are my four bone- or horn-handled forks. They're small and light with carbon steel tines that are thin enough to test potatoes and beets for doneness with out leaving gaping holes, and strong enough to lift a chicken from a roasting pan. My forks, which are well over 100 years old, are sharp, so I use them to pierce impossible-to-open plastic packages, prick pie dough, turn cutlets and mash butter. I love my tongs, but when it comes to an all-around handy utensil, the forks are it. Here are a couple I found on eBay. I wouldn’t pay more than $20 for one fork. If you have a vintage tool you like to use, send me a photo and short description of what it is and why you like it, and I’ll post it here. Email me at [email protected]. 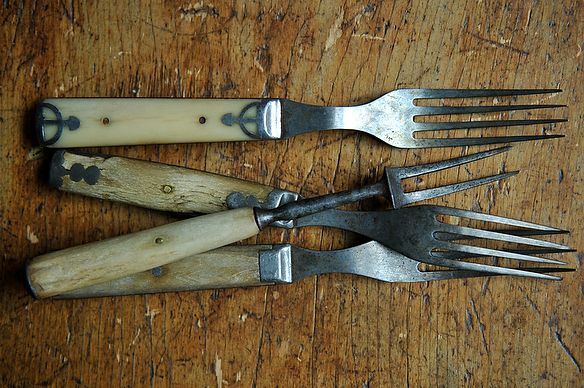 Tom Hirschfeld: I love the Sheffield antlered knife and fork I got at some auction for in a 50 cent box of stuff. I found them at the bottom and I have treasured them ever since. 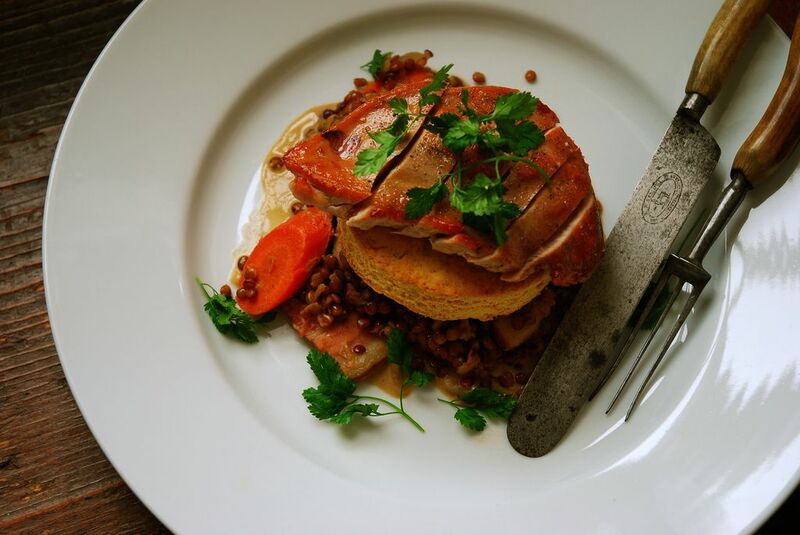 They go nicely with the smoked pheasant and lentil pot pie don't you think? 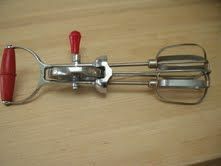 Elizabeth Schmitt: This eggbeater was a wedding shower gift that my mother received in 1948. She used it all her life and it now lives in my kitchen. 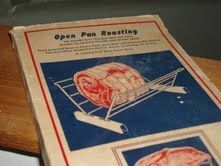 I remember being allowed to beat the pumpkin pie custard with this when I needed a step-stool to reach the counter. Perhaps this isn't as old as you are looking for, but it's special to me! '50's box it came in. Julia Devine: Grandmother's whisk. It's a little funky (a little "soft" if that makes any sense), and takes some getting used to, but I still love it! Mary Constant: I have a ancient marble mortar and pestle that was my grandmother's. As I was growing up my mother never used it for cooking. Instead, it was by the barn door where my father filled it with fresh milk every evening. Generations of barn cats licked the bowl smooth. When I started cooking I stole it from the cats. (they also had an old Indian mortor found on our dairy ranch in West Marin) . 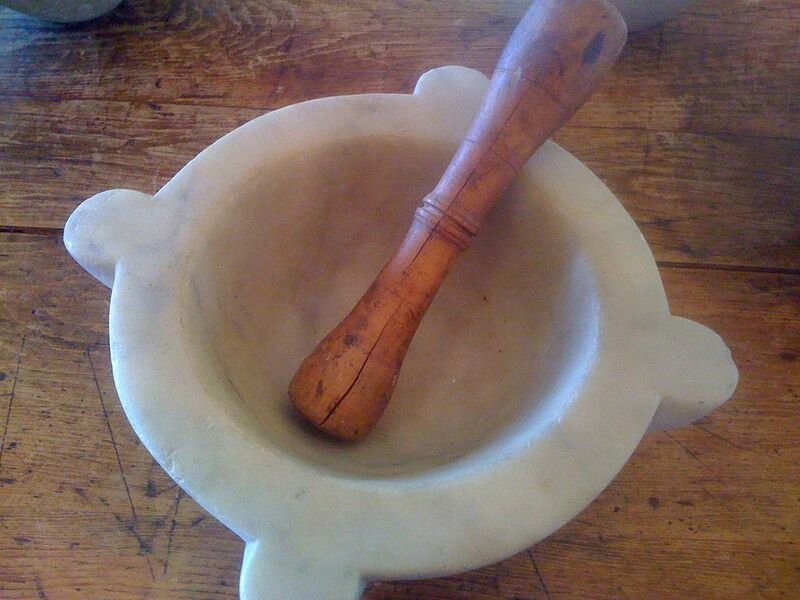 I have used this mortar and pestle for over 35 years to grind spices, make pesto and butters. It was the first of what has become a collection. Last year my vineyard manager from Mexico made me one from the volcanic rock that is everywhere on our Calistoga vineyard. My grandmother had a silver cake cutter, which basically looked like a long-handled fine-tooth comb with about 6 inch long tines. When we cleaned out her house after Hurricane Katrina (It flooded, but she lived in the upstairs apartment, so we were able to rescue her things. ), we found it and my sister took it, so I don't have a picture. I think this kind of cake fork is for angel food cake. Love the forks, love vintage cookware. I'm really looking forward to spending some time hitting flea markets, estate sales, and antiques stores here to source out some goodies for our kitchen. In my family, we really get behind big spoons. I'm not kidding: my mother has told me that if anything happens to her, to "make sure I get her big spoons," because my sister will throw them out. Now I want to see one of these big spoons! I have a few long-handled hand-carved kitchen spoons that I've picked up at yard sales and thrift stores. I have no idea how old they are -- they look very old -- but I use them the same as my other wooden spoons. So far, no chips or breaks. I love them. Great story -- what kind of food did she cook? I also love old kitchen stuff! I've inherited many old utensils, platters, aprons, etc. that I cherish. I like how a lot of cookware never goes out of style. My grandma Bunny always had a three or four of those turning forks in her utensil drawer. I managed to end up with just one that belonged to her and it lives attached to my fridge with a super duty magnet, the most useful art I've ever known. Like the magnet idea. I started using the forks because my grandmother and mother (and now sisters, too) cook with them. I'm down with Amanda on old forks (and other stuff). I travel California's Hwy 101 all the time and I like to take detours and bop around in some of the old downtown centers which often go back to the end of the 19th Century. If you have the eye you can find cool stuff in antique stores. And for what it's worth, if I have my history correct, the fork was first introduced to France via the court cooks of Caterina di Medici when she was married to Henry II. Italians had devised them for eating pasta. Yes, but Pierino, who invented the spork? The spork? Would that be Rachael Ray? She also invented the stoup. Not the one you sit on. I love old kitchen stuff. The store that hosts the Pound Ridge Farmers Market is called Antiques and Tools of Business and Kitchen. It's got a tremendous collection of all sorts of things. Some people think it's a junk shop, but I love all those old doo-dads. Will see if they've got any old bone-handled forks! Thank you for helping me understand the likely provenance of the four forks that were my Greatgrandmother's. When we were clearing out her house, for some reason, I kept going back to the box of kitchen items to fiddle with those forks, finally slipping them in my purse at the last minute. Like you, I find them incredibly useful. So glad you didn't leave them behind! we must be shopping at the same stores. If you come across any great finds, let me know!